The Battle of Corydon was the only Civil War Battle fought on Indiana soil and occurred on July 9,1863 when 450 members of the Harrison County Home Guard attempted to delay General John Hunt Morgan's 2,400 Confederate soldiers that day, in hopes that Union reinforcements would arrive and stop Morgan's march through southern Indiana. Morgan's Raid began near Sparta in eastern Tennessee on June 11, 1863. It was intended to divert the attention of the Union Army of Ohio from Confederate forces in Tennessee. Morgan was ordered to confine his raid to Kentucky only and not to cross the Ohio River. For some unexplained reason, Morgan defied General Braxton Bragg's command and led his cavalrymen on a 46 day, 1,000 mile raid. It ended with his capture near New Lisbon, Ohio on July 26, 1863. Morgan and most of the division were from Kentucky and they were welcomed with open arms through much of Kentucky. However, they were forced into skirmishes with federal troops and home guards at several points. On the morning of July 8, they arrived at the small Kentucky river town of Brandenburg. Two steamers were seized, the Alice Dean and the T.J. McCombs, to transport the troops across the Ohio River to the Indiana shore east of Mauckport. The crossing was interrupted by some artillery fire from a small company of the Harrison County Legion, and the riverboat, the Lady Pike. 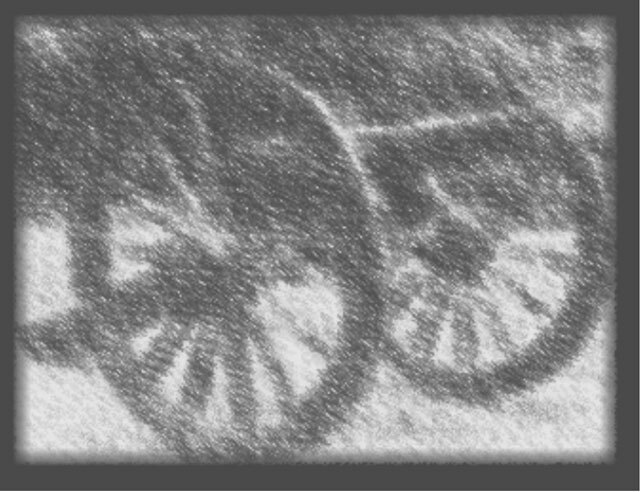 When Morgan's artillery returned fire, the Lady Pike retreated and the six-pounder on the Indiana shore was silenced. The crossing was completed without further incident and the Alice Dean could be seen at low water resting on a sand bar near- the Indiana shore. The gun which had fired on Morgan was captured, along with several prisoners. Indiana Governor at the time Oliver P Morton, on receiving the information of the invasion of Indiana soil, issued a proclamation ordering all able-bodied male citizens in the counties south of the National Road to form into companies and to arm themselves with such arms as they could procure. On the morning of July 9, the advance guard led by Morgan's brother, Colonel Richard Morgan, moved north on the Mauckport Road. One mile south of Corydon, the county seat of Harrison County, the scouts encountered the Harrison County Home Guard (officially the Sixth Regiment of the Indiana Legion). The home guard, under Colonel Lewis Jordan, had drawn a battle line behind a hastily thrown up barricade of logs. In a short but spirited battle, lasting less than an hour, Morgan met his first and only organized resistance in the Hoosier State. By outflanking both wings at the same time, Morgan's men completely routed the militia. Four of the guards were killed, several were wounded, 355 were captured, and the remainder escaped. The victory was not without cost to the Raiders. Eleven Raiders were killed and 40 were wounded. Morgan paroled the prisoners upon entering the town of Corydon. The Raiders began collecting the spoils of victory. Most of the afternoon was spent plundering the stores and collecting ransom money. The Harrison County treasurer was relieved of $690, two leading stores were relieved of $600 each, and contributions of $700 to $1,000 were demanded from the three mills to save them from being burned. 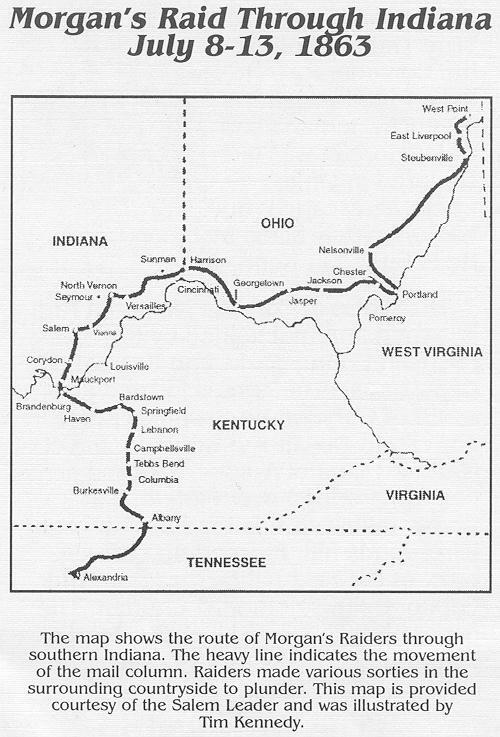 Later that day, the rebels left Corydon and marched northward. The main column took New Salisbury. Several companies made sorties over the countryside to other villages, collecting fresh horses and plundering. They camped along the road south of Palmyra for a few hours that evening. On the morning of July 10, the troops reunited in Salem and the raid continued.